Guitar Jar Magazine Shop are happy to present the brilliant The Great Acoustic Guitar Chord Songbook. With so many available these days, it is good to have a make you can trust. The The Great Acoustic Guitar Chord Songbook is certainly that and will be a superb acquisition. For this great price, the The Great Acoustic Guitar Chord Songbook comes highly recommended and is always a popular choice amongst lots of people. Midpoint Press have provided some great touches and this means good value for money. One of the greatest collections of acoustic guitar songs, all in one book! 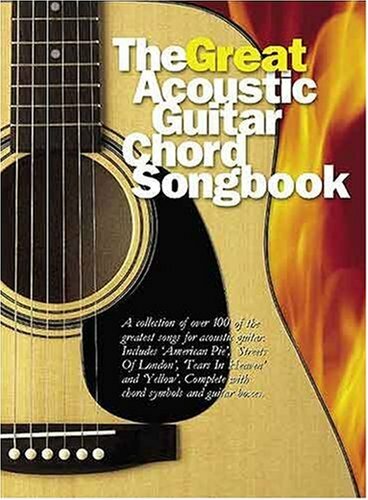 The Great Acoustic Guitar Chord Songbook contains over 100 classic favourites, all authentically arranged for Guitar with full lyrics and chord boxes! As well as offering superb value for money, this is an absolute must-have for any working or busking guitarist's collection.